Gold… tried and failed many times! Much of gold’s appeal comes from reflecting off itself or other nearby gold, creating highly saturated areas – not so much when presented as a box shape like here. The shinyness also makes it pick up a lot of light and surrounding colors, often shifting overall appearance more to warmer hues. This also makes referencing from photographs very hard, as well as adjusting it to a different composition. I will have to try again! 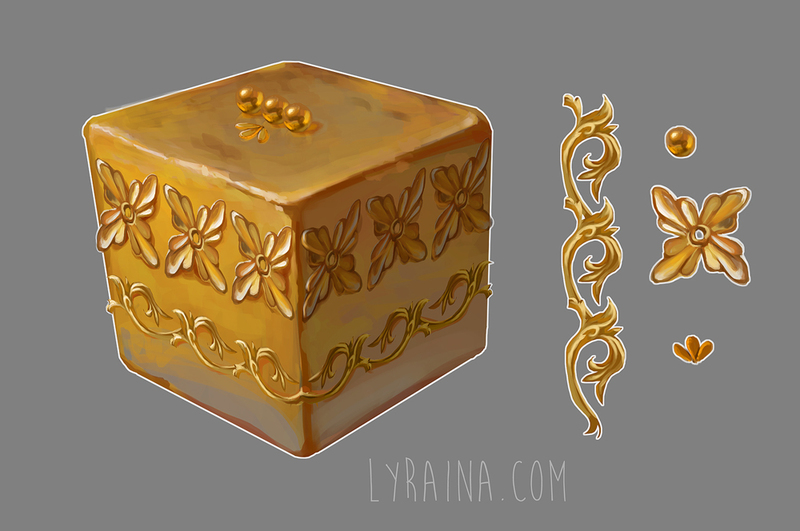 On the bright side, this cube would do well as a very expensive wedding cake, methinks. Maybe placed on a golden or warm color plate, for less dull reflections. A bit cheesy though… just like this cube. Hah!